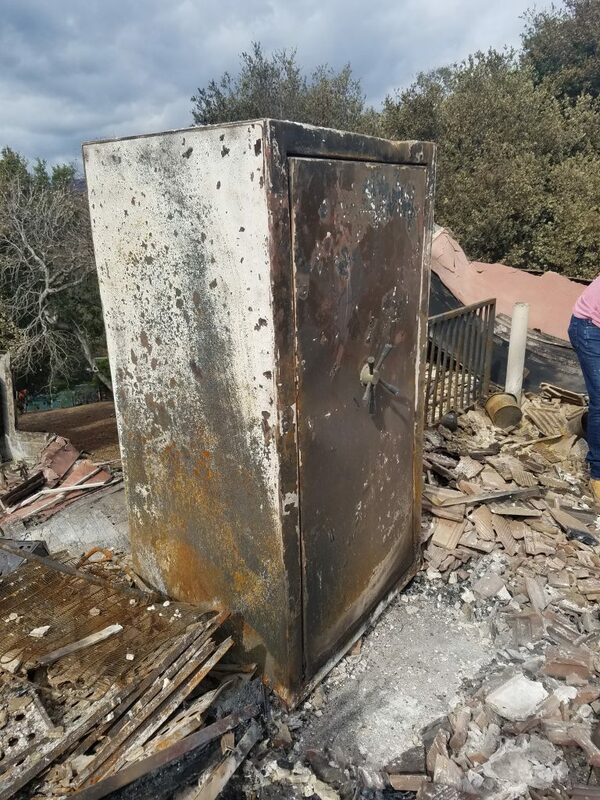 Champion Safe withstands fire in California. Many people looking to protect valuables or lock up guns rank fire rating low on their list of buying considerations. But home fires cause roughly $6.7 billion of damage to property each year, according to the National Fire Protection Agency. NFPA also reports that at least one home fire occurs every 85 seconds. So maybe it’s time to understand fire ratings a little more. Quality of insulation: Gypsum is the preferred type of insulation because when it heats up to 262 degrees Fahrenheit it release water vapor, which absorbs heat. Looks for multiple layers when safe shopping. Coverage: Manufacturers who cut costs will cut back on the amount of insulation in difficult to reach areas, such as hinges and the surrounding area. Be wary of safes with lots of bare metal. Thickness of metal: Safes with thinner metal walls and doors will warp within minutes if the hosue fire grows intense. Inspect the thickness of the materials used. Seals: High-end manufacturers will use seals that expand as they heat up, working to keep the most intense heat out if the metal does start to warp. Paper chars at approximately 400 degrees, and guns are damaged when temperatures exceed 500 degrees, so it is recommended that the internal temperature of a safe should never exceed 350 degrees. The fire rating of a safe is based on two factors. The first is the external temperature the test safe is exposed to. The second is how long, in minutes, it takes the internal temperature of the safe to reach 350 degrees. Some examples where a non-fire-rated safe might be desired would be to prevent young children, the elderly or mentally challenged from having access to firearms. – If you live in the city, you have good access to a fire department. Look for a minimum 60-minute fire rating at 1,200 degrees. – If you live a considerable distance from a fire station, look for a higher fire rating of 90-120 minutes at 1,600-1,750 degrees. – If you have expensive collectors items or family keepsake items in your safe, look for a fire rating of 120 minutes at 1,750 degrees. Everyone has something they value, something they want to protect from fire or theft. You need someplace to safely store and protect your most valuable items and papers, jewelry, those family heirlooms and keepsakes, and your firearms.